Dependable Direct's Industrial Grade packing tape was born out of a search for the most durable, hard-working and efficient tape on the market. Super Quiet, Smooth Design: You won't believe the ease of which you can apply this tape. The ultra-quiet design won't wake the kids up either.Worry Free Packaging: Designed with premium acrylic adhesive to secure your packages with confidence for months.Perfect for Warehouse, Home or Office: This versatile tape is built with strength and holding power in mind to serve a wide variety of applications. Whether using this for storage, moving or packing boxes in a warehouse, this tape is designed to meet industrial level specifications. ENHANCED STRENGTH & HOLDING POWER: We searched far and wide for an INDUSTRIAL GRADE tape that works harder than the rest. This Dependable Direct packing tape bears the strength and holding power to grip your boxes together with confidence. 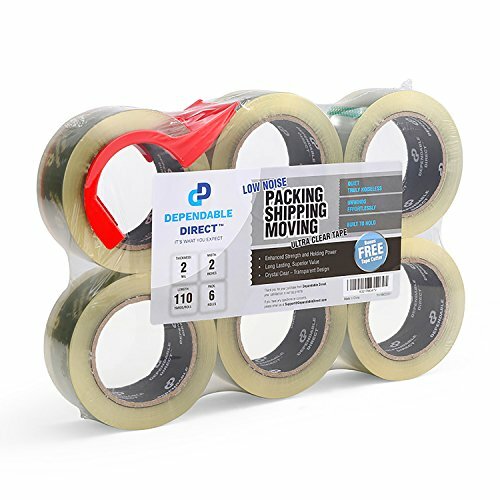 Whether you are moving, storing, shipping, packaging or simply just want reliable tape on hand for the times you need it, this HEAVY DUTY packing tape won't let you down. LONG LASTING - MORE TAPE FOR YOUR MONEY: Ever run out of tape half-way through a box? We certainly have and it slows us down. We want to eliminate that situation as much as possible by including, in every roll we sell, a whopping 3,960 inches (110 yards) of HARD-WORKING, packing tape so you can get the job done right, every time. ULTRA QUIET, EFFICIENT DESIGN: For those situations that may require a bit more quiet application, our ultra quiet premium acrylic adhesive tape is designed to roll off the spool with ease. Of course, without sacrificing strength and durability. THOROUGHLY TESTED: We've sent our tape through multiple levels of testing to ensure it meets ASTM and SGS standards. STANDARDIZED SIZING: This tape is 2" wide with a length of 110 yards. The core diameter measures 3" and will fit any standard tape dispenser. The thickness of the tape is 2 mil. If you have any questions about this product by Dependable Direct, contact us by completing and submitting the form below. If you are looking for a specif part number, please include it with your message.